The major players in LED driver market are Texas Instruments, Inc., Osram GmbH, Harvard Engineering, Maxim Integrated, Inc., General Electric, Macroblock, Inc., Rohm Semiconductors, Cree, Inc., and Atmel Corp., among others. These players are set to bolster the global LED driver market in the years to come. 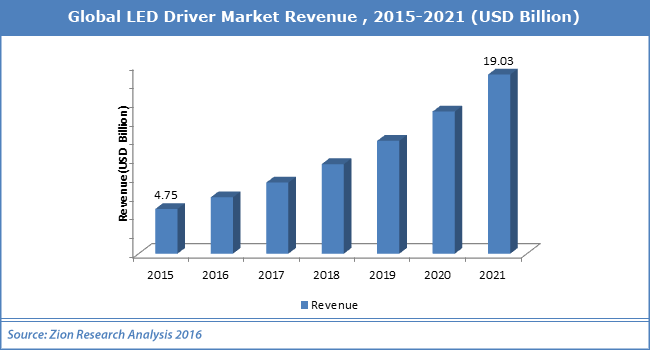 Analysts at Zion Market Research claim that the global demand for LED driver market was capitalized at almost USD 4.75 Billion in 2015 and is likely to create income of almost USD 19.03 Billion by 2021, developing at a CAGR of slightly more than 26% from 2016 to 2021. Global LED driver market is expected to see significant development over the years to come due to increasing requirement for LED lighting by households, as per analysts at Zion Market research. The transition to UV LED from UV lamp is the newest trend in LED driver market. Rising demand of LED in lighting applications such as office complexes, retail outlets, and street lights is set to bolster the LED driver market. IN addition to this, rapidly increasing usage within the households in residential lighting applications for is one of the major boosters for the development of the LED driver market. On the other hand, the biggest hurdle for LED tech is to recognize the gap between benefit and cost by the consumer. Growing acquisitions and mergers by market players is also one of the major factors that are boosting the development of LED driver market. For instance, in 2018, Fulham Company Group (which is a top provider of electronics and lighting components) purchased some assets of the Lumotech’s LED Driver business so as to supply LED drivers to OEMs and distributors in Europe, boosting the LED driver market. Commercial and residential application of LED lighting is powering the growth of LED drivers market. Residential division added up for almost 40% of the LED driver market share in 2011. Outdoor applications such as street lighting, roadway lighting, and tunnel & highway lighting are some of the primary adopters of LED driver market. India has large user base for LED lighting goods and a number of consumers are assumed to augment substantially in the near future propelling the LED driver market. Asia Pacific is likely to develop at the highest development rate for the LED driver market in the years to come. Economic development in up-and-coming nations such as China and India result in high usage of LED lighting. Hence, rising demand of LED lighting drives the LED driver market.